Don’t emit carbon. Ride it. Keeping carbon in the ground, one pedal stroke at a time, day and night. "We have met the enemy and he is us" is a parody of a message sent in 1813 from U.S. Navy Commodore Perry to Army General Harrison after his victory in the Battle of Lake Erie. Unfortunately, that quote has today ceased to be a parody and has become a reality given the massive unfolding environmental crisis. How then do we –humans– defeat ourselves in the war we have been waging against the planet? And what role scientists –at the forefront of evidence gathering– can play in this societal transformation? Scientists appear to be increasingly willing to sign appeals calling for bold and ambitious shifts in public and economic policies. However, one relevant question to ask is whether scientists answer their own calls. Do we have evidence that scientists personally and professionally achieve unmatched levels of carbon neutrality and more generally of sustainability? Evidence suggests the opposite with a study having found that environmental scientists often engage in environmentally harmful behavior and have only a slightly lower footprint than medics and economists (or an equal footprint when travelling to work). I can recognize myself in this paper, as I have not been able to give up professional flying. The public (including scientists) typically blame the by-default culprits for the environmental crisis: politicians. This, however, invites some nuanced remarks. First, while some politicians deny climate science documenting the cause, scale and impact of global warming, one can wonder whether scientists may indeed be climate deniers themselves. We, scientists, call politicians to listen to science, but appear to not listen to our own science, by e.g. failing to radically engage universities in a forced march towards carbon neutrality, where academic success would no longer be carbon intensive (i.e. flying). When not listening to science, politicians may simply listen to scientists who tell them through their actions that the imperatives of personal and professional lives are more important than carbon neutrality. Petitions by scientists –which I have signed too– may be the latest trend in activism chic. Politicians know very well how to fix climate change, they simply do not know how to win the coming election (or remain in power until then). The public may support a change of economic system but hardly anybody wants to change in practice. Said otherwise, the public may be scared by the consequences of climate change, but cannot stop loving even more the causes of climate change. Blaming politicians for inaction may somehow be an easy way of avoiding to question many aspects of our way of life. The inconvenient truth is that effectively reducing carbon emissions is likely to require switching to a war economy – keeping carbon in the ground at all cost. Carbon dioxide (CO₂) emissions from fossil fuels and industry are projected to rise more than 2% (range 1.8% to 3.7%) in 2018, taking global fossil CO₂ emissions to a new record high of 37.1 billion tonnes. Le Quéré C, Andrew RM, Friedlingstein P, Sitch S, Hauck J, Pongratz J, Pickers P, Korsbakken JI, Peters GP, Canadell JG, Arneth A. Global carbon budget 2018. Earth System Science Data. 2018 Dec;10:2141-94. Even if the Paris Agreement is implemented, the Earth may enter hothouse conditions, with the climate stabilizing at a global average of 4-5°C higher than pre-industrial temperatures and a sea level 10-60 m higher than today. Steffen W, Rockström J, Richardson K, Lenton TM, Folke C, Liverman D, Summerhayes CP, Barnosky AD, Cornell SE, Crucifix M, Donges JF. Trajectories of the Earth System in the Anthropocene. Proceedings of the National Academy of Sciences. 2018 Aug 14;115(33):8252-9. Mora C, Dousset B, Caldwell IR, Powell FE, Geronimo RC, Bielecki CR, Counsell CW, Dietrich BS, Johnston ET, Louis LV, Lucas MP. Global risk of deadly heat. Nature Climate Change. 2017 Jul;7(7):501. To at least have a miminum of consistency, I have been trying to figure out how I would live if carbon emissions were individually capped, inspired by Winston Churchill quote "we must take change by the hand or rest assuredly, change will take us by the throat”. It turned out that change was readily available since 1817 and called the bicycle. Nevertheless, a French report by the National Institute of Statistics and Economic Studies found out that 58% of journeys less than 1 km (!) to work were by car. Commuting by bicycle brings its own challenges. People living in some cities (mostly European cities) may have access to a dedicated network of safe bicycle lanes. Cycling on regular roads carries an increased risk of potentially deadly traffic accidents and exposure to high atmospheric pollution. Bicycle commuting in the countryside is less often heard of because distances are typically longer and infrastructures are lacking. This was the perfect challenge to meet. During the past few years, I have attempted to switch my commuting from car driving to cycling, irrespectively of seasons and weather. 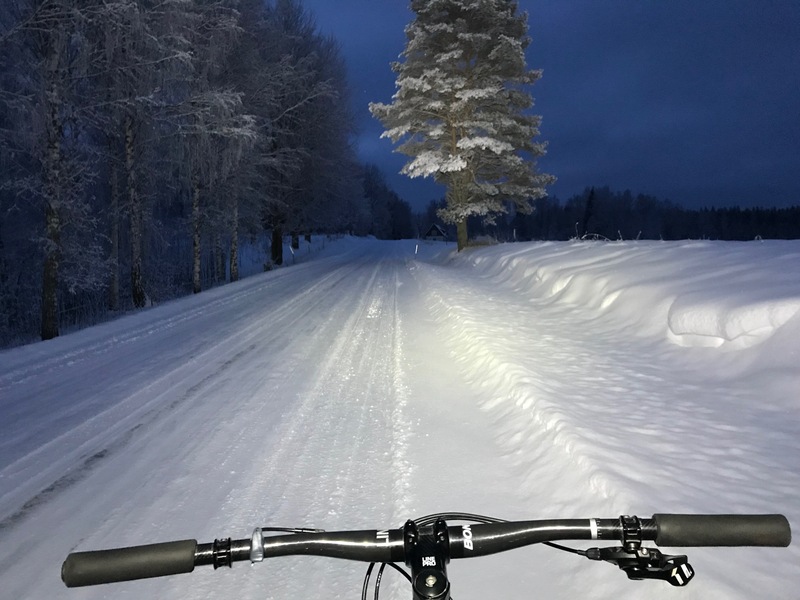 A one way ride (18.6 km, 242 m elevation gain) typically takes 40–45 min in spring-summer-fall, while in winter negative temperatures and low tire pressure (to have a better grip on ice) mean a ride takes a wealthy 1h 15 min. 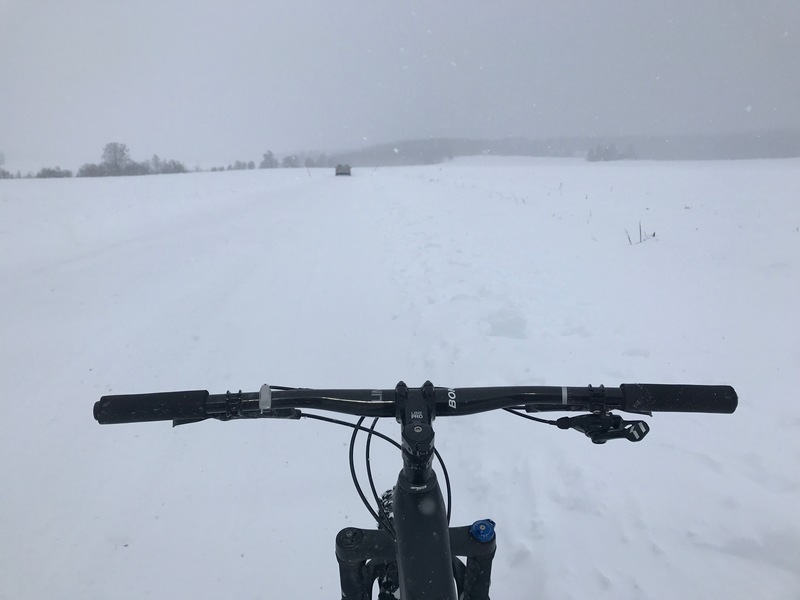 With a reasonable amount of planning and sweat, I have found that it is possible to substantially cut carbon emissions from commuting even in an unlikely setting. I can save on average 1 ton of carbon emissions annually by not commuting with my car. 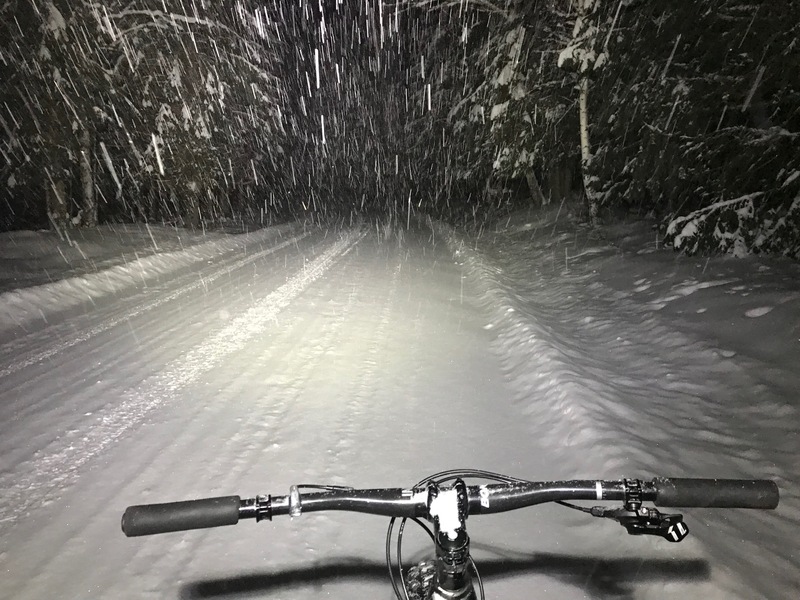 For would-be winter cyclists, here is some technical info: tires are studded fat 4.6” Dillinger 5 by 45NRTH, lamp is a Cobra 6500 by LEDX and winter snout is by Airtrim. And many thanks to 30k store in Skövde for bike preparation and service. Website of Guillaume Chapron © 2019. The views and opinions expressed in this website are mine only and do not whatsoever reflect the official policy or position of any other agency, organization, employer or company I am or have been associated with.